In an important article, John Devereux recently provided a thorough and critical examination of Cuban statistics on aggregate production. Among other things, he drew attention to the sharp increase in Cuba’s real GDP growth (as recorded in Cuban official statistics) from the beginning of the XXI century until the sharp slowdown in 2014, when Venezuela cut oil deliveries to Cuba by half. Devereux correctly related this striking development to an acceleration in the output of government services. He thought this acceleration was not credible and he re-calculated GDP in government services for that period by assuming that it increased at the same rate as other outlays, thus yielding a downward revision in the growth of aggregate real GDP. Doctors- for-oil agreements and the growth of government services. An examination of the sectoral breakdown of Cuba’s real GDP indicates that the acceleration in government services is entirely accounted for by a surge in the output of the public health sub-sector. This note examines the behavior of GDP in this sub-sector and suggests that its acceleration since 2001 reflected the rise in Cuban exports of medical services (doctors, medical technicians and nurses). These medical practitioners (and other professionals including teachers, military officials and security personnel) were sent to various countries, including notably Venezuela and Algeria, in exchange for shipments of petroleum and products. Unfortunately there is no information on the number of doctors (or other professionals) working outside Cuba, nor on the wages received by these professionals, most of which is captured by the Cuban government. Therefore the analysis must rely on an indirect approach. The paper examines the relation between total GDP in the health sector (which accounts for the bulk of government services) and Cuba’s exports of services; those exports are known to include payments for the work of Cuban professionals abroad. Around 2015, when Venezuela, facing a severe economic crisis, decided to cut sharply its oil exports to Cuba, the Cuban government diversified its exports of medical services by shipping doctors to new countries, in particular Brazil. The strategy followed in this paper is to examine the relation between Cuba’s exports of services (adjusted to exclude tourist services) and GDP in the health sector. The assumptions underlying the analysis are the following. (i) Services exports include transactions other than exports of Cuban health practitioners, for example communication services and oil refining. There is no data on these transactions, but they are thought to be comparatively small, and they are ignored in this paper. (iii) Cuba’s exports of professional services other than medical personnel are assumed to be small and are ignored. I would like to thank John Devereux and Luis Luis for their helpful comments. “The Absolution of History: Cuban living standards after sixty years of Revolutionary Rule”. Paper presented at the annual conference of the American Economic Association. Atlanta Georgia. January 4, 2019. Data on GDP for health services is provided in the annual reports of the National Office of Statistics and Information (ONEI). It is labeled “public health and social assistance”, but it consists overwhelmingly of health services, as the numbers for social assistance are very small. ONEI records payments associated with the work of Cuban professionals abroad as exports of services, even though they could be recorded more properly as factor payments. For example the number of admissions in health care units was approximately unchanged from 2000 to 2016. During that period, the number of beds in health care units declined by 17% (actual rate). 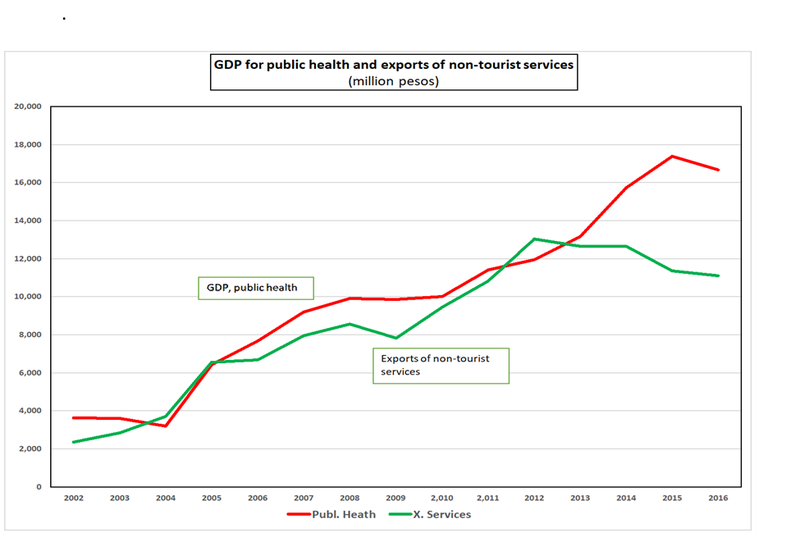 Fig 1 shows a fairly strong relation between GDP in the public health sector and exports of non-tourist services, with an adjusted R2 of 0.812. (Regression results are shown in the table at the end of the paper).Variables are in current pesos, converted at the official exchange rate of 1 peso per US dollar. The sample period begins in 2002, just after the Accord between Cuba and Venezuela began operations; 2016 is the last year for which data are available. Figure 1 suggests that the correlation between the two variables broke down in the late years of the sample period, when services exports declined—as expected because of the drop in the world price of oil and the cut in Venezuelan oil exports to Cuba—but nominal GDP for health surprisingly continued to rise, falling only in the last year of the sample period. John Devereux has found that there is also a strong correlation when the regressions are run in first differences. 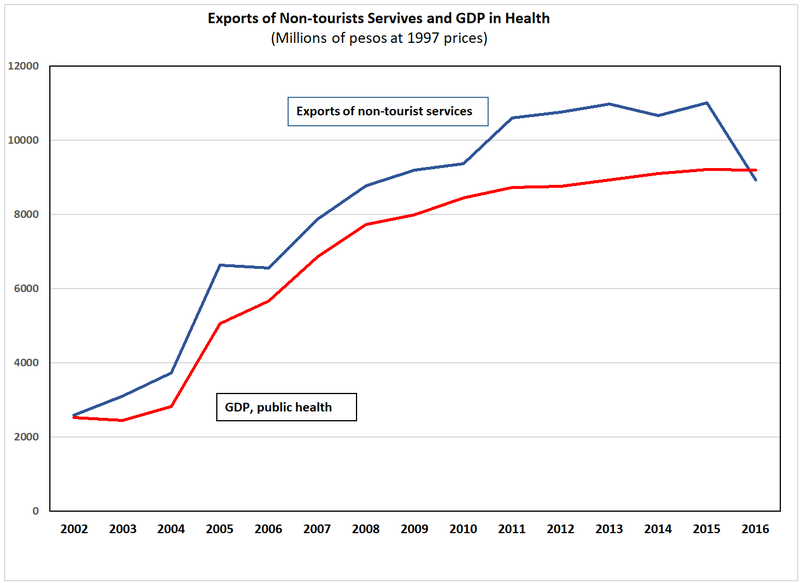 Figure 2 illustrates the relation between exports of services and GDP for health in constant 1997 prices. Here the correction is even higher than when nominal values are used, with an adjusted R2 of 0.914 and a much higher t ratio on the health coefficient. In Fig. 2 exports of services decline, but only in 2015. Health GDP continues to rise in the late years of the sample, albeit slowly. Undoubtedly, several questions remain to be answered, and the analysis could be improved in various ways. In particular, efforts should be made to identify exports of services other than tourism and medical services, and to ascertain the breakdown between exports and domestic transaction in the GDP for public health. Moreover, attempts could be made to quantify Cuban exports of professional services in areas other than health, such as education. The empirical results reported in this paper suggest that the sharp increase in the growth of government services after the turn of the century reflected the doctors-for-oil agreements rather than manipulation of the data. There is, however, another issue. ONEI records payments associated with the work of Cuban professionals abroad as exports of services, even though they should be recorded as factor payments. According to ONEI’s methodology these payments affect the balance of goods and services and therefore GDP. This is not entirely correct, however, because these payments (unlike, for example, tourist receipts) are not associated with the domestic production of services. To that extent, real GDP is overestimated. However, payments for the work of Cuban professionals abroad are factor receipts and therefore are part of the current account of the balance of payments and of national income as well. Avvordingly, they influence personal consumption, albeit indirectly. In that sense their effect is similar to that of a rise in GDP. 5. Of course it is possible that both GDP and exports were doctored in a way to show artificially fast growth while maintaining consistency between the two series; but I doubt it. ONEI statisticians occasionally engages in the silly practice of discontinuing publication of certain series upon instruction from by senior officials who consider the data to be critical or embarrassing. But it is not in their tradition to deliberately falsify numbers.